Model T Ford Forum: Are these Model T's? Model T Ford Forum: Forum 2014: Are these Model T's? 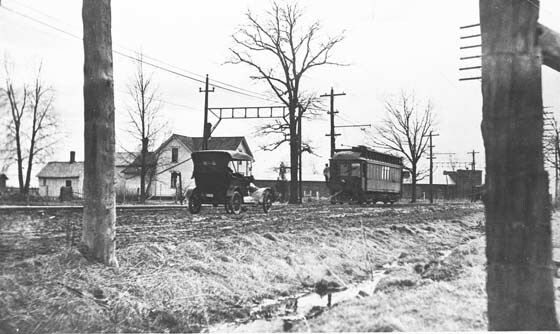 Are these Model T's in these 1916 photos? Looks like April, Mud Season in the upper Mid-west. Looks like a rope between the Interurban and touring. John, nice pics. What those poor people endured, and their T's back then! I see your new to the forum, so I'll say "Welcome"
Got one or more T? Send pics if you do. A lot of the veterans here will chime in with lots more advice than I can give you, it'll be great to have. But I don't want to say they are T's unless I am sure. Last time, Harold "Hap" Tucker on this forum helped me out. Is Hap still around? The first one is a 1915-1916 Model T. The second I do not know, but looks to be a bigger, more expensive car. 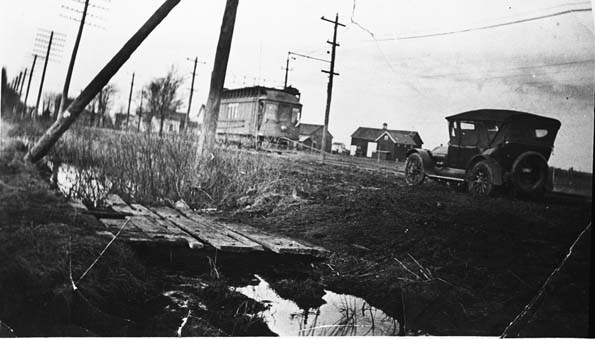 In both pictures it looks like there is a rope with the railcar being used to pull the cars through the mud. What areas were serviced by the Interurban. Does anyone know. I know there was a track going thru Marion, In. where I grew up. It's just a guess, but the second car may be a 1914 Cadillac due to the oval rear window and a few other features. If the rear window of the Model T in the top photo has two parts, it could be a later replacement top... that would date the photo around 1917 or later. Hard to say for sure due to size of the photos. Thank you! I'm sticking with 1914 Cadillac for the larger car. The rear window on the T does appear to be split in two panes... curve of fenders is a bit tricky to tell to identify the year exactly. Yep, Hap's still around. He too gave me tons of "introductory advice" when I got going here. Surprised he hasn't chimed in yet. Must be busy with Labor Day festivities. Mine are done with. Again, welcome to the affliction! Thanks, Bill, Tim, Richard, Derek, et al!